Launching the North Korean satellite seriously alarmed the whole world. This action was condemned not only by the representatives of the United States and South Korea, but Russia and China that traditionally have favorable attitude towards the DPRK. The UN Security Council prepares to discuss new sanctions against North Korea. North Koreans themselves are glade of the national science and technology achievement. The UN Security Council condemned the launch of a ballistic missile, made by North Korea. At the initiative of Japan and the United States, New York held an emergency meeting, when the DPRK's actions were declared as previously adopted resolutions violation. In this regard, soon, the UN Security Council is to toughen sanctions against North Korea. The problem of the North Korean satellite was not the satellite itself, but the way that it was send on the near-earth orbit. The ballistic missiles were used for it. The ability of the state to launch a satellite means that it has technologies to create strategic ballistic missiles. Earlier, North Korea carried out in 1998 and 2009 similar launches. The UN Security Council prohibits the DPRK to hold such launches, but the Koreans ignored the ban. From a formal point of view, North Korea is a sovereign state, such as Russia, the USA or China. 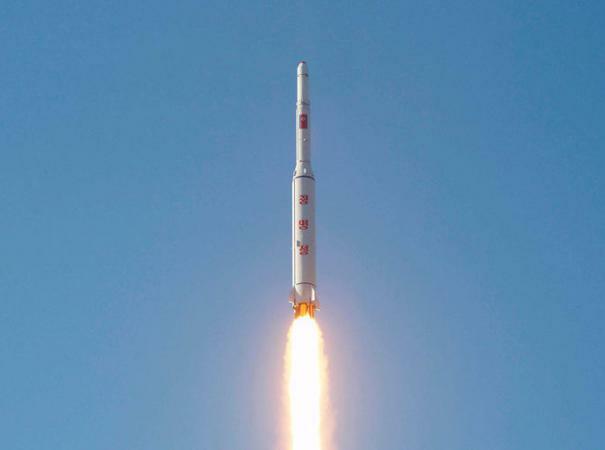 Since these countries have no limits in carrying out such tests and launches of spacecraft, from the point of view of the North Korean can expect the same attitude. In fact, it is not the case. Actual sovereignty does not coincide with the declared one. An example of North Korea can serve as an indication that in the modern world the sovereignty is not something given by default and a feature of any state. The sovereignty is not something given, but the objective. All actions of North Korea which are internationally criticized, linked with the desire to defend their own sovereignty. And North Korea succeeded in it. Recent nuclear and missile tests in North Korea show that the country managed to create a relatively effective military-industrial complex. The presence of weapons of mass destruction, primarily nuclear, is the guarantor of the North Korea sovereignty. The Juche ideology itself is base on self-reliance and is intended to prove the concept of the North Korea sovereignty, as the supreme value, and to mobilize the masses to its defense. From the West point of view, North Korea sovereign policy is a dangerous. The desire to determine vector of its development, political system, foreign policy orientation, to stay "closed" to globalization and ideology of “open society” is considered as the crime, followed by punishment by sanctions. Therefore, Russia and China joining to criticism and even to sanctions against North Korea looks like following the same line of the globalist policies. But, both powers have other reasons for it. Any complications in the Pacific region are crucial to the balance of forces in the world fastest growing region. The negative reaction of China and Russia on North Korea's action is approved by the fact that this occasion will be used by the Americans to strengthen its influence in the region, maintaining the existing US military infrastructure in South Korea and Japan and deployment global missile defense system in South Korea. In fact, it will be aimed primarily against Russia and China, not North Korea, which is not a particular threat to the United States. The another important point is the position of Japan. In 2015, the USA decided to bet on Japan as its main partner in the fight against China. “The North Korean nuclear threat” is an excellent occasion for the further rapprochement of Japan and the United States. However, at the same time, with military and political strengthening of Japan, its made several attempts to get closer to Russia, to intensify the process of peace treaty preparation, repeatedly raised the issue of Putin's visit to Japan. According to a number of key international problems, the Japanese took a conciliatory position towards Russia. Now the North Korean satellite launch is used to stop the rapprochement between the two countries. The US-controlled South Korean intelligence agencies said about Russian involvement in the creation of the Korean ballistic missiles. Japan introduces new sanctions against North Korea. Russia forced to use harsh rhetoric to maintain ties with Japan. It is significant that the Russian Minister of Foreign Affairs after the incident with the North Korean missile held immediate consultations with his Japanese counterpart. Too sovereign behavior of the North Korean leadership is not approved by anyone right now. And it creates a certain ideological conflicts. On the one hand, Russia and China stand up for the principle of national sovereignty, on the other hand, attempts of small states such as North Korea to uncontrollably use their sovereignty lead to difficulties for their allied imperial formations, such as Russia and China. It is obvious that the two powers would like to control more the situation in North Korea. In the near future the significant proportion of the efforts of both countries will be used for it. From the theoretical and doctrinal point of view, the problem of North Korea's behavior indicated that it could be solved not within the realist concept of sovereign nation-states, but within the framework of a multipolar world, where civilizational centers has absolute sovereignty – the poles of the new world system. Joining the formal criticism of North Korea, China and Russia have yet actually prepared to support this country . Russian representative to the UN Vitaly Churkin said that sanctions should not undermine the DPRK economic system. Both countries do not want to be led, especially Russia, which’s concessions to the West were considered previously as a sign of weakness by the Asian countries. The ability to find out an approach to North Korea could become one of Russia's trump cards in negotiations with Japan. An excitement on the North Korean nuclear and missile programs will be used by external actors. At the same time, Russia and China will try to demonstrate its diplomatic muscles and act as a mediator in the negotiations with North Korea, and the USA is to use the fear of North Korea to increase its military presence in the Pacific Ocean.